This is the first in what I hope is a series of blogs relating to turf care professionals. It is not a technical or detailed look at turf care. The purpose of these blogs is to highlight the passion, skill and dedication of the lawn care professional. I had mentioned on Twitter that I was keen to chat to a variety of local lawn care professionals in order to capture the thoughts of like-minded turf enthusiasts. I was delighted when David Hedges-Gower (@realawnexpert) responded and suggested I chat to Mark Farrell (@mf6791_mark). Mark trained under David many years ago and was now the head of ground care at Greenock Morton Football Club. Mark and I made contact through Twitter and we arranged to meet up. I was really excited about my visit to Greenock Morton FC’s ground, Cappielow Park. Anyone who has watched a football match will notice football pitches take a bit of a beating from players’ boots over the course of a match. What some people may not be aware of is football pitches may also be used for various training sessions and matches throughout the week and in the evenings. That’s considerably more activity than an average family lawn gets over the course of a week (although as my two young boys get older I’m sure they’ll be testing our lawn and my lawn care to its limits). What makes Cappielow Park’s football pitch a little different from many other pitches across the UK is, among other things, it’s located a mere dual carriageway width in distance away from the sea on the west coast of Scotland. It’s also one of the most played on football pitches in the Scottish game. I met Mark at pitch side and we had a great chat about our backgrounds. Mark had worked in a variety of turf care roles in the past, including golf courses and amenity grounds. He has worked at Cappielow Park as the head groundsman for 10 years. Looking out onto the pitch Mark said the pitch was a little different to when he first arrived. Back then he recalled the pitch having an excess of thatch, and that it had taken him the best part of 2 years to get the pitch near to its current condition. As we set off walking towards the centre circle I found myself scanning the grass. I could see every blade. There were no weeds, each blade of grass was almost vertical, and the ground had holes in it from a recent aeration. I couldn’t help but stop and reach down to run my fingers through the grass. I guess that’s just something that lawn advocates can’t help themselves from doing. Mark showed me the single tractor unit and attachment he uses to aerate the ground, and the various other items of machinery he uses to care for the turf at the football ground. What struck me immediately was Mark did not have a suite of high tech machinery and state of the art lawn care equipment. I was surprised. To me a football pitch is quite a large area to manage, and players, owners, board members and supporters have high expectations of their hallowed grounds. Mark is well aware of other football clubs who are able to spend a great deal of money on turf care and turf care machinery. Without this kind of budget Mark is even more reliant on his experience, knowledge, dedication and passion for turf to ensure the football pitch at Cappielow Park stays healthy and looks good. Contrary to what some people may think about the care of football pitches, Mark does not use an excessive amount of fertilisers and other chemical treatments on the turf at Cappielow Park. Doing so can initially produce wonderfully looking lush green grass on the surface, however the grass can become weak and lazy. Giving turf too much sustenance can therefore be worse than giving it none at all. Too much of a good thing and the grass is fooled into thinking it’s on a permanent luxury holiday. This makes the grass lazy, results in a large build up of thatch, and can make it susceptible to damage. Mark says grass really wants to grow and take hold. It wants to establish well, and if we give it the right conditions, treatment and maintenance it will thrive. It is not about giving it luxury and making it lazy. It’s about making it work for a living. It’s not my intention to explain what each of these particular treatments do for the turf, but together they help improve and maintain healthy soil and grass. It’s possible for the pitch at Cappielow Park to take about 60 tonnes of sand as a top dressing each year. Mark removed a square of turf to show me the roots and soil beneath the grass. It was possible to see the various years of top dressing in the soil. It was similar to the lines in a cut piece of a tree trunk, although not quite as distinct. Mark also encouraged me to touch and smell the soil. It was light, crumbly and smelled fresh. We also looked at the grass roots. Mark explained that at the moment (end of January) the roots were fairly shallow. As the year progresses these roots will penetrate further into the soil. Mark used the analogy of the grass holding on tighter as it begins to grow quicker. The problems some people have is when the turf on their pitch doesn’t hold on tighter because it is getting too much fertiliser and treatment throughout the season. Marks smiles and says some people think that if their turf looks good from the top then it must be good underneath. In fact it’s vital that turf is strong from the bottom up, and not the other way around. A good balance of feed is what is required. Enough to make the grass strong, but not too much that the roots think they are on holiday and forget to hold on tight. One final turf care task Mark completes is blowing the grass with a backpack leaf blower. This lifts the blades of grass after being trampled upon during the course of a football match and allows air and light to penetrate through the turf. This is a task that can take Mark up to 2 days to complete. Now that is a dedicated and passionate turf care professional. 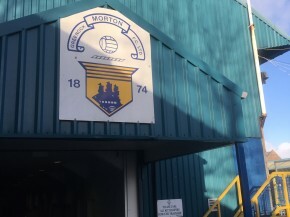 If you are interested in other people’s views of the pitch at Cappielow Park and seeing images of it you may like to type Cappielow Park into a Twitter or internet search, or follow the club on Twitter (@Morton_FC). You will see that it has a reputation for being one of the best football pitches in Scotland (if not ‘the best pitch in Scotland’ as more than one Twitter user has commented). A reputation like that doesn’t come about by accident. It comes about as a result of the efforts of the person who cares for the turf and manages it throughout the whole year. Mark’s favourite time of year is the Spring when he can see all his efforts over the Autumn and Winter come to fruition in a great looking pitch. It was an absolute privilege to spend time with Mark. It was a great insight into the work that goes into maintaining an exceptional playing surface, and an exceptional piece of turf. Thank you to Mark, and Greenock Morton Football Club, for taking the time to speak with me. It was a day I will never forget.